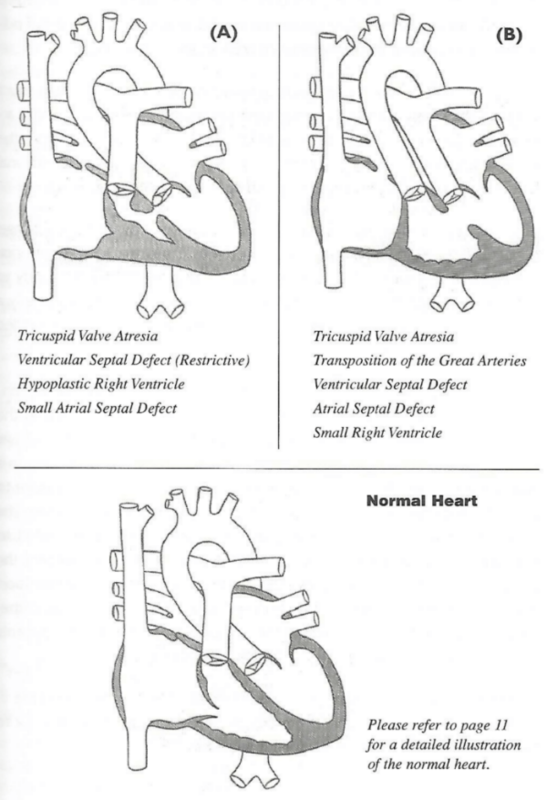 There are many types of congenital heart defects (CHDs) with different degrees of severity based on size, location, and other associated defects. In more severe forms of CHD, blood vessels or heart chambers may be missing, poorly formed, or in the wrong place. 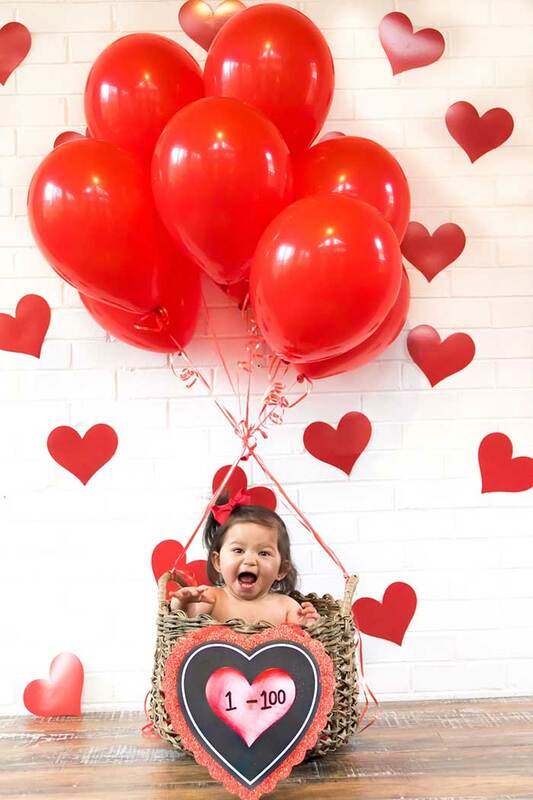 About 1 in every 4 babies born with a CHD has a critical congenital heart defect. Below you will find information about some of the most common types of CHDs. Additional information about these and other CHDs, including treatment options, can be found in our It's My Heart book. 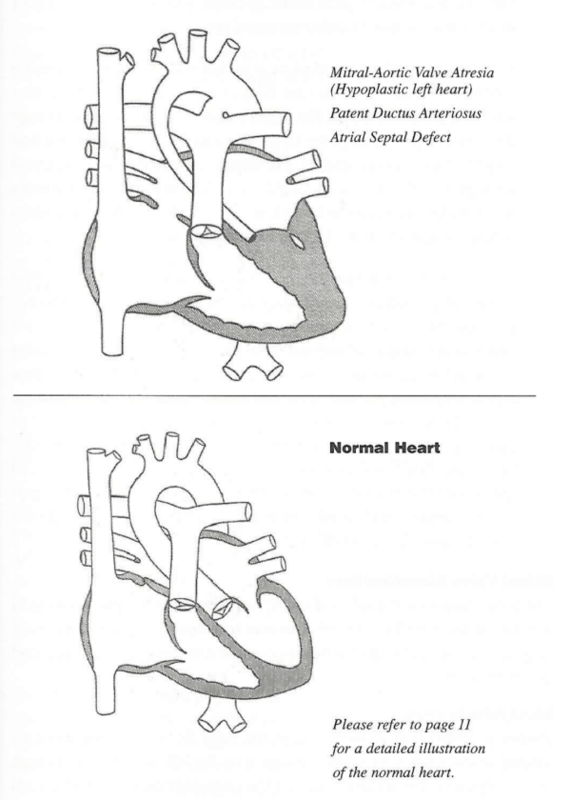 Click on each CHD listed below to see a drawing of the defect, as shown in It's My Heart, along with a description below the image. Aortic Stenosis is a narrowing or obstruction in the aorta, the largest blood vessel in the body, which serves as a passageway for pink oxygen-rich blood to leave the heart and to get pumped into the body. Any obstruction in the aorta requires the heart muscle to work harder to get blood out of the heart. 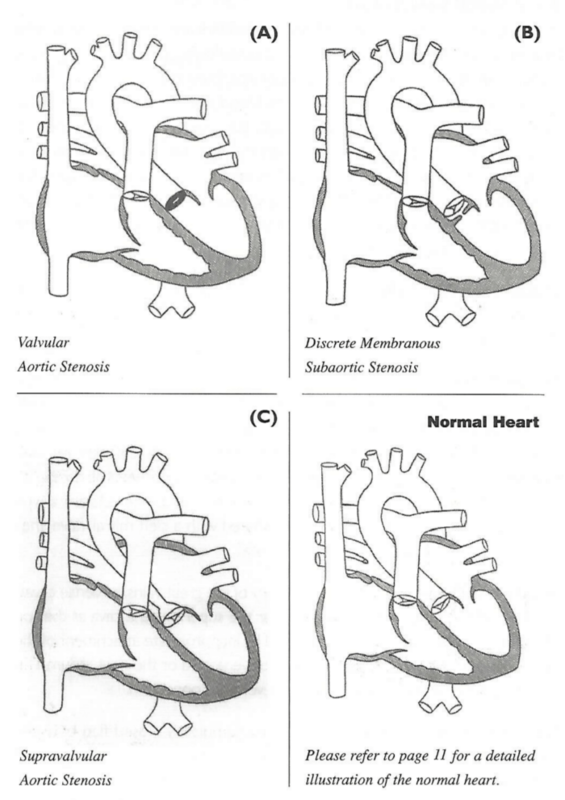 Aortic stenosis can occur in one or more of three areas of the aorta: subvalvar, below the aortic valve; valvar, having to do with the aortic valve itself; or supravalvar, above the aortic valve. Each type of obstruction requires a different type of repair and can occur congenitally or develop at any time during a person's life. An atrial septal defect is a hole in the septum between the right and left upper collecting chambers of the heart, the atria. A hole can vary in size and may close on its own or may require surgery. 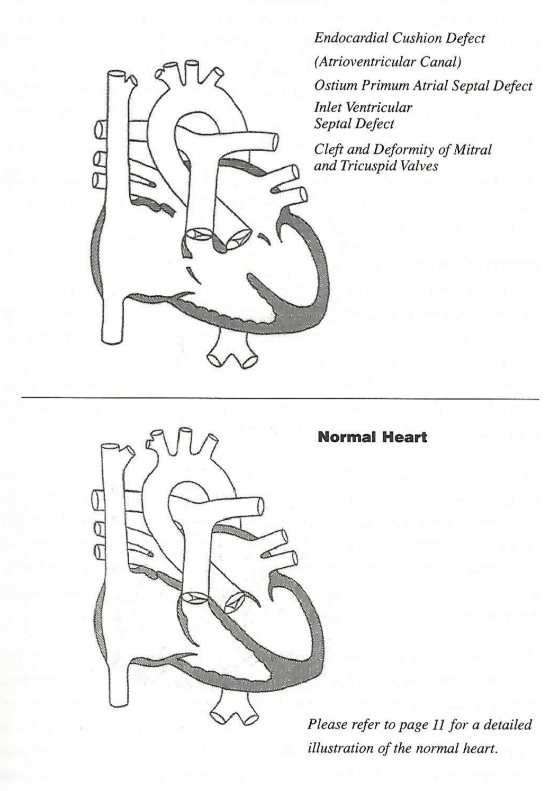 An atrial septal defect is one type of congenital heart defect. Depending on the location of the hole, these defects have different names: Ostium Secundum Defects, Ostium Primum Defects, Sinus Venosus Defects, Probe Patent Foramen Ovale (FO). 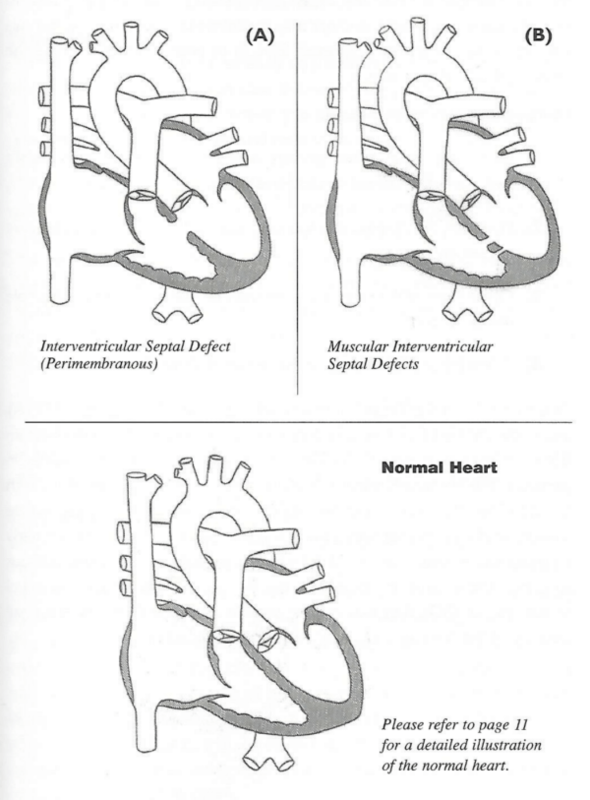 Hypoplastic Left Heart Syndrome (HLHS) occurs in about 1% of all congenital heart defect cases. 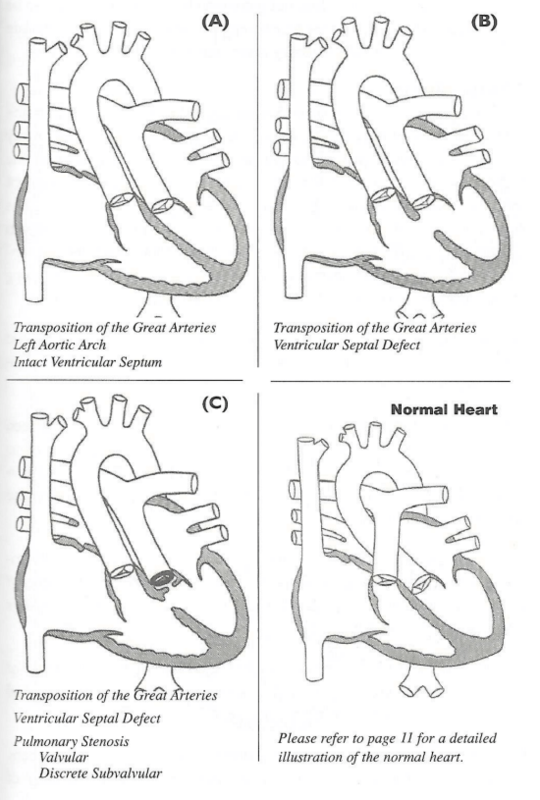 The left ventricle (LV) is hypoplastic, meaning it is under-developed or not functioning. Essentially, the LV is not functional because the valves leading into and out of the LV, the mitral and aortic valves, are severely stenosed (tight), or atretic, meaning impassable or not allowing any blood flow. In addition, the main route out of the left ventricle, the aorta, is also hypoplastic. The newborn baby may initially appear to be well during the first hours or even days of life. However, as the baby breathes on its own, the pressure in its lungs begins to decrease. Also, the patent ductus arteriosus, a tiny vessel between the aorta and pulmonary artery, will begin to close after birth. Then, the baby will appear sicker, breathing quickly, not feeding, showing a faster heart beat and congested lungs. 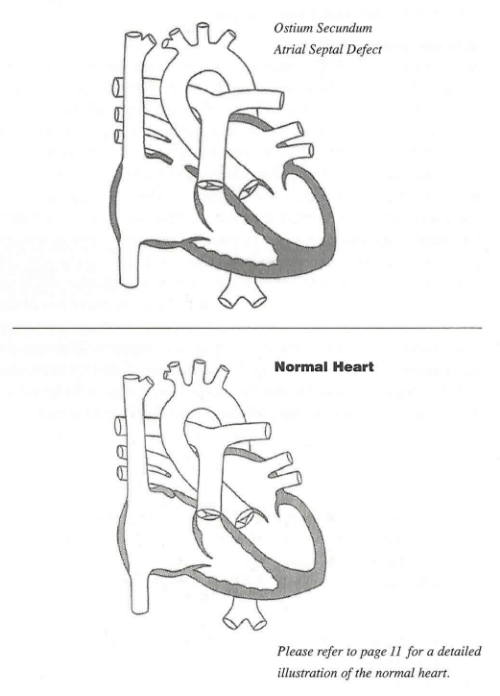 HLHS is considered a critical congenital heart defect. Pulmonary stenosis is a narrowing or obstruction between the right and left ventricle and the pulmonary (lung) circulation. The most common obstruction is the pulmonary valve stenosis. A normal pulmonary valve allows blood to flow freely from the heart's pumping chamber, the right ventricle, into the vessels leading to the lungs, the pulmonary arteries. The valve usually has three leaflets, or cusps, that open widely when the ventricle pumps. When the ventricle relaxes, the leaflets close tightly and do not allow backflow, or regurgitation, or blood into the right ventricle from the pulmonary artery. In valvar stenosis, the leaflets are partially fused together and unable to open completely. Frequently, there are only two leaflets, called a bicuspid valve, instead of three. Pulmonary valve stenosis creates extra work for the right ventricle that must deliver the blood into the pulmonary arteries regardless of how tight the narrowing. Heart failure occurs when the ventricle can no longer deliver. 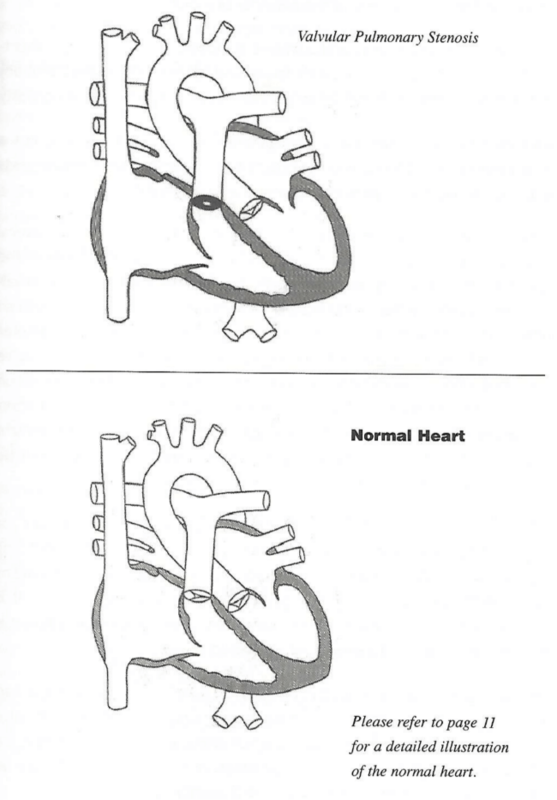 Tetrology of Fallot (TOF) is a combination of four different heart problems. The term "tetrology" comes from the Greek word for "four". 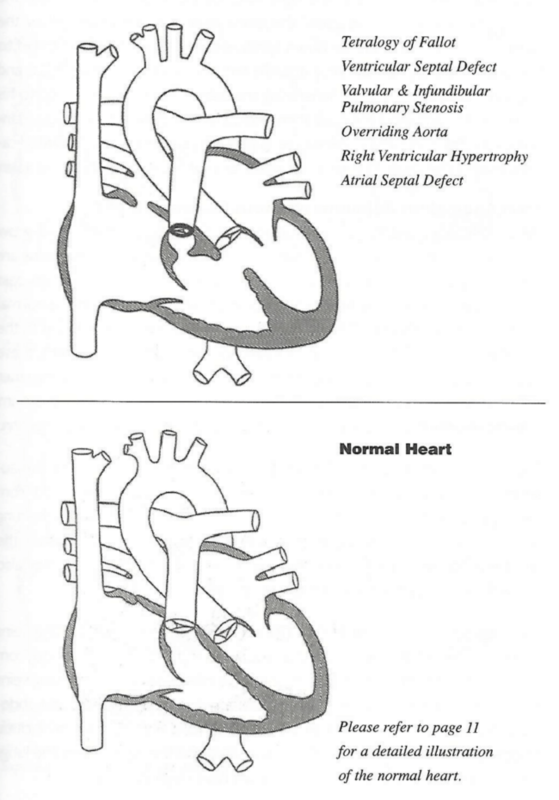 The four problems are: pulmonary stenosis (PS), ventricular septal defect (VSD), overriding of the aorta, and right ventricular hypertrophy. In transposition of the great arteries, the aorta comes off the right ventricle and the pulmonary artery arises from the left ventricle. The aorta will then take unoxygenated blood back to the body, before it can flow to the lungs for oxygen. The pulmonary artery takes blood from the left side of the heart back to the lungs. Infants born with transposition of the great arteries will be blue or "cyanotic" at birth or soon after birth, because unoxygenated blood is being delivered to the body. Tricuspid atresia is a birth defect of the heart where the valve that controls blood flow from the right upper chamber of the heart to the right lower chamber of the heart doesn’t form at all. In babies with this defect, blood can’t flow correctly through the heart and to the rest of the body. 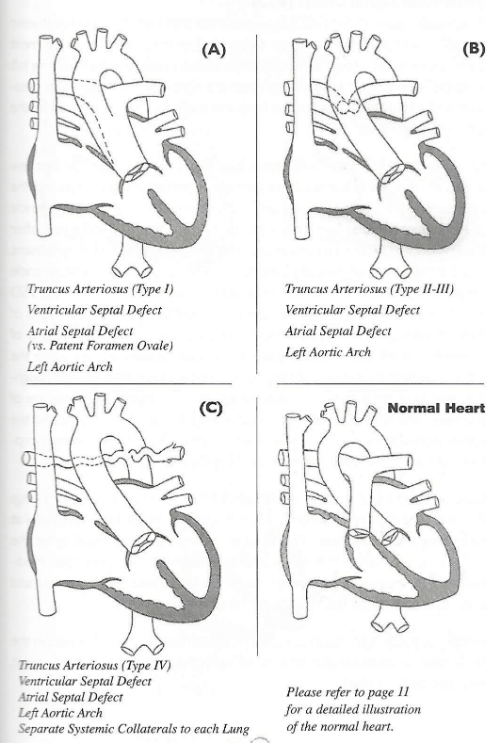 In tricuspid atresia, the tricuspid valve is not present. The only way for blue blood to get to the right ventricle is through a hole in the wall between the right and left atria. This hole, called atrial septal defect, allows oxygen-poor blue blood to mix with oxygen-rich pink blood in the left side of the heart and travel to the left ventricle where it is pumped out the aorta and throughout the body. This mixing of the blood will create a slight bluish color in the child, called cyanosis. Truncus arteriosus occurs when the blood vessel coming out of the heart in the developing baby fails to separate completely during development, leaving a connection between the aorta and pulmonary artery. There are several different types of truncus, depending on how the arteries remain connected. There is also usually a hole between the bottom two chambers of the heart (ventricles) called a ventricular septal defect. A ventricular septal defect (VSD) is a hole in the partition, or septum, between the two lower pumping chambers (ventricles) of the heart. This is the most common congenital heart defect. This hole allows blood to cross from the left ventricle, where the pressure is high, into the right ventricle, where the pressure is much lower. The larger the hole, the more blood will cross from the left to the right side.